NBC’s new series, Parenthood is quickly changing autism awareness to the public. Reel life parents Adam (Peter Krause) and Kristina Braverman (Monica Potter) discover that their young son Max (Max Burkholder) has Asperger's Syndrome, which creates a barrier between the two. Adam struggles to find a way to connect with his son. Writer and executive producer of “Parenthood,” Jason Katims has a personal tie to the storyline. His 13 year old son has Asperger's Syndrome. It is considered as the “milder variant” of autism. Aspies or persons with Asperger’s are able to function in everyday life; have average to above average IQs. They have significant difficulties in social interaction and behaviors maybe seen by others as unusual or strange. Last February 20, our Family Support Group facilitated by ASP’s National Vice President, Perlita So. 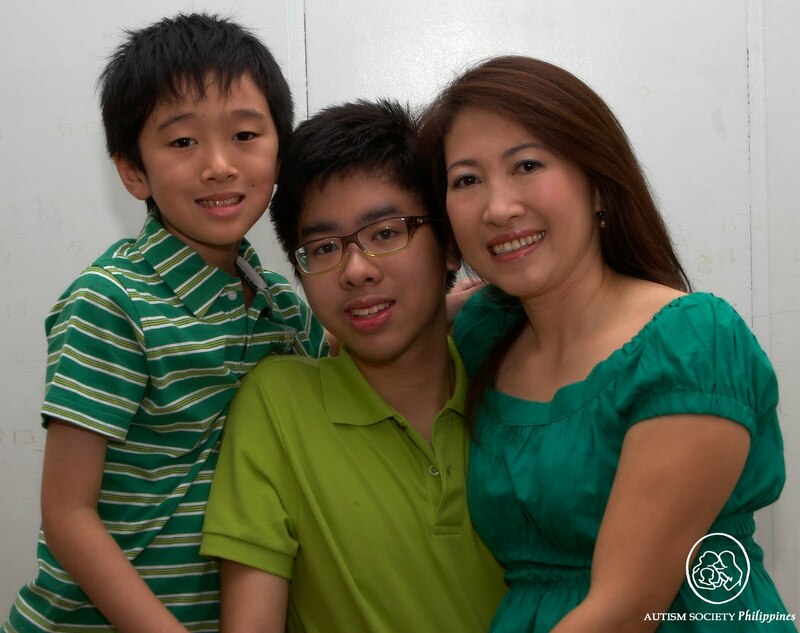 Peng is mother to Patrick, a teen with Asperger’s Syndrome (AS). Patrick is now an incoming sophomore of BS Life Science at the Ateneo de Manila University, one of the top universities in the Philippines. Raising two sons on the spectrum is not an easy task. So we asked for Peng’s parenting secrets. Most children or adults with AS find it difficult to express emotions (like showing appreciation). Speaking in a high pitched or monotone voice, coupled with a poker face, doesn’t help earn friends. Make him feel that being “different” doesn’t mean “being loved less.” This will give him a sense of security. Make them feel important even if we are not fully confident in them making the best decisions or their capability of giving sound opinions. Listen to them. A few years back, I had several apprehensions on Patrick feeling ignored or worse, be “non-existent” in school. So I suggested to Patrick to join his classmates for lunch. I even encouraged Patrick’s classmates to invite him to join their table. After several unsuccessful attempts, one of the classmates told me “Ma’am, maybe he prefers to eat alone.” It struck me at that point to remember asking what his preferences were, rather than making decisions on his behalf. If your child has sensory issues, awkward movements or poor coordination, asking help from professionals like occupational or physical therapists might come in handy. Your therapist can suggest you to move from one on one therapy, to group sports. This summer vacation will be a good time to explore possibilities. For the young adult with AS, enroll him at a gym for weight training program. A personal trainer can assist him. Going to the gym not only help improve his muscle tone, it is also a good place to practice his social skills. A social skills program allows the child with AS to be involved in a group of neurotypical children. During the group therapy, he will be equipped with strategies and skills (like how to successfully interact with his peers). Individual counseling sessions is also advised. A clinical psychologist will be helpful in addressing the Aspie’s personal concerns pertaining to his individuality. Due to their difficulty in social perceptions, children with AS do not see themselves as how people see them. Since being fashionable might not stir up their interests, they might not care on how they look. Showing him pictures of what’s hot in fashion will give him an idea on how he should dress up. Telling him that “people are unconsciously judged by how they look” will help make him understand the importance of being well dressed. Choose a subject where he is good at (like in physics or trigonometry). Organize study groups. The idea here is for others to see what they can benefit from being acquainted with the person with AS. Sharing his knowledge or certain skill can earn him popularity. People will be drawn to him because of what he can teach them. This will definitely make him feel needed and boost his self esteem. What if one day your child asks, ”Why am I different from others” or “What’s wrong with me”? Keeping your child’s diagnosis from him is your choice. But if you do decide to tell him and doesn’t have the guts to do it yourself, try leaving books, CD’s, articles on autism lying around where you know he won’t miss them. Expose him to activities that involve people with autism is another option. This is a place where he can feel welcome and accepted. Talk to him about popular, successful and well loved people with autism or Aspergers Syndrome. This will help make him feel that autism is not something to be depressed about. Patrick Louie So, “The Math Wizard,” will showcase his piano skills on AutiSMusical to commemorate the 3rd World Autism Awareness Day April 9, 2010 from 3pm to 6pm at SM The Block, North EDSA, Quezon City. For more details call us at 9266941 or email us at autismphil@pldtdsl.net. my son is 5 years old and recently diagnosed with Asperger's Syndrome. The day the diagnosis was handed down to us was the one of the saddest. There were fears for his future. But as we try to understand Aspies, we are slowly eased from fear and uncertainty. Your article is also of help. In a few years, we hope to see our son moves on in life just like any Aspies in the world. We love him now, more than ever. Thank you for sharing. Thank you for sharing this article. We also have a five-year-old son diagnosed with AS. What therapy Centre in Manila can you suggest that best works with Children with AS? Thank you and God bless!